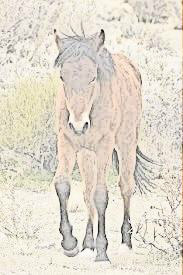 I never wanted a pony as a child, there were enough wild ones loitering around the home where we lived and they always terrified me, especially when their ears went right back and they began to snort! But my sister did want a pony! She longed to ride with her friends across the sandy beaches where we lived and return home through the valley. And to my disappointment, her wish came true. Well sort of! One late summer’s day, straight from school my father took us with him to a farm on the other side of the moor. Thankfully, the weather was dry and warm and at the very least, it got me out of doing my homework. ‘We have to walk,’ my father said, ‘because we might be bringing something back.’ I knew it was going to be a pony and sulked all the way there and all the way back, with a rather reluctant pony in hand. He was a sad looking horse, brown, with hunched shoulders, if you know what I mean. And his eyes, they wern't bright and excited looking like one would have expected from a youngster who was about to go off on an adventure. In many ways, I knew how he felt and although I wasn't fused on having a pony, I did feel sorry for him. ‘It’s a wild pony daddy,’ I kept telling him, ‘and he will not be tamed. You should set him free to live with the others. It’s obvious that is where he must have come from.’ And many days and nights I sat with Frisky, talked and sang to him but he continued to put his ears back and snort at me, just like the ponies in the wild. In the end, and despite the cries of my frustrated sister, Frisky was eventually sold and sent to England where, I understand, he settled down to a civilian life on Dartmoor and was very happy. Thankfully, we never did have another pony.